Up until that day, I had served as both the treasurer of the Dartmouth College Republicans and a member of the College Republicans’ executive board. Many of my friends, both liberal and conservative, asked me why College Republicans chose to invite Horowitz. After all, Horowitz spoke at the end of October, just two weeks before the 2018 midterm elections. The Dartmouth College Democrats had already hosted both Molly Kelly, the Democratic nominee in the New Hampshire gubernatorial election, and Congresswoman Annie Kuster ’78, who represents New Hampshire’s 2nd District. The College Republicans were certainly not short of options. Two local Republican governors, New Hampshire’s Chris Sununu and Vermont’s Phil Scott, both faced reelection. Meanwhile, Republican nominee Steve Negron challenged Annie Kuster for the 2nd District, and Eddie Edwards sought to reclaim the nearby 1st District, which had turned blue in 2016. But the Dartmouth College Republicans didn’t invite any of these promising Republican speakers. They invited David Horowitz. Members of the College Republicans, myself included, found the decision shocking. I heard nothing about Horowitz’s invitation until a week before the event. That lack of transparency, coupled with the decision by the College Republicans’ to invite him, prompted me to step down as treasurer and quit the organization. My replacement, current treasurer Eashwar Sivarajan, joined the Groupme of the Dartmouth chapter of the Young Democratic Socialists of America, where he encouraged members to “organize some resistance” to the Horowitz talk. The College Republicans aren’t the organization I used to know. During the 2017-18 academic year, Dartmouth College Republicans created a welcoming community for conservative students while encouraging dialogue with other groups on campus. The club welcomed input from all members during meetings. We organized a number of events, including meetings with officials from the New Hampshire Republican Party and multiple dinner discussions, co-hosted with College Democrats, on issues like the Antifa movement and climate change. In April, College Republicans came together with College Democrats for a debate on the Tax Cuts and Jobs Act as well as other economic issues in America. Since this fall, however, the College Republicans have shifted away from respectful discourse and abandoned the community they supposedly represent. The last meeting with an open invitation to campus happened in September, and the College Republicans’ only messages to the campus events listserv during winter term concerned the club’s most recent speaker. The College Republicans haven’t hosted a single recent event with College Democrats, and dialogue between the two groups appears to be finished. Instead of reaching out to campus and trying to bring more students in, as it used to, the College Republicans have shut their doors to anyone who does not follow its newfound fringe ideology. On Feb. 11, College Republicans brought Dinesh D’Souza ’83 to campus. D’Souza, a convicted felon, pleaded guilty in 2014 to making illegal campaign contributions. He also wrote a book in 2007 called “The Enemy At Home: The Cultural Left and Its Responsibility for 9/11.” In February 2018, D’Souza mocked survivors of the Marjory Stoneman Douglas High School shooting on his Twitter account. The College Republicans’ decision to invite him only confirmed the disconcerting shifts within the organization. Meanwhile, the Dartmouth College Democrats brought multiple presidential hopefuls to campus, including New York Senator Kirsten Gillibrand ’88 and Washington Governor Jay Inslee. New Jersey’s Senator Cory Booker and New Hampshire Representative Annie Kuster visited in October, less than a week after the David Horowitz talk. While the College Democrats invite high-profile political leaders, the College Republicans brings in far-right provocateurs. The College Republicans must do better if they hope to make meaningful contributions to Dartmouth’s campus. 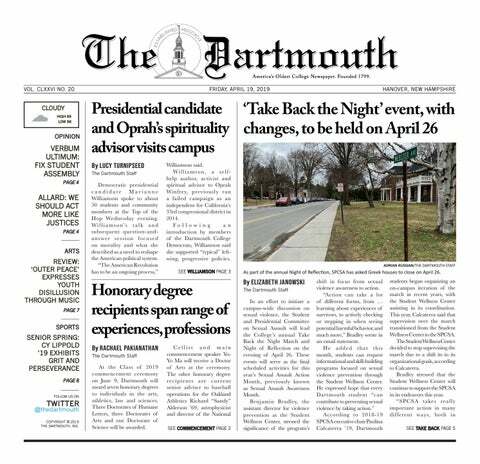 Last month, the current treasurer of College Republicans, my successor, wrote an opinion piece attacking the editorial board of The Dartmouth and the larger Dartmouth community for not respecting the “conservative minority.” He claims that The Dartmouth’s opinion writers remain dominated by “pernicious progressivism” and were “too busy complaining about alleged oppression to devote time to actually listening to what D’Souza had to say.” I agree that conservative students are the political minority at Dartmouth. However, suggesting that we face open hostility from campus institutions is an overstatement. The current treasurer’s claim reinforces a false narrative pushed by David Horowitz that conservatives face persecution on university campuses across the United States. What’s more, my successor implies that D’Souza and the College Republicans, in their new, far-right form, still represent the conservative community. This is, sadly, no longer true. Until the leadership of the College Republicans stops complaining about its alleged victimhood and recommits itself to respectful dialogue, it will continue to lack both legitimacy and dignity. Kaplan is the former treasurer of the Dartmouth College Republicans.